It is August and school will be starting soon. I hope you all have a great first couple of days of school and to help with that here is my Back to School Pinterest board. My message in this post is simple, “give kids the web.” Students today need to be connected and learning doesn’t stop when school is out. I encourage you to use the web this year and increase the ties to technology in your classroom. Technology does not need to be integrated with every lesson but technology does engage kids to help find the importance with the content presented. 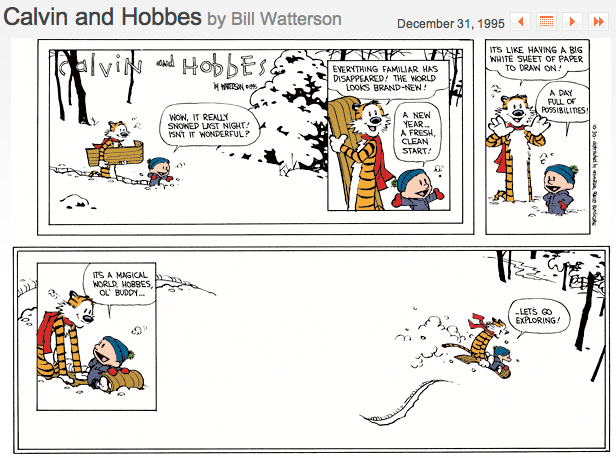 Below is a great Calvin and Hobbes comic that relates to starting a new school year. I challenge you to use a new technology tool with your class this year. Here are a couple ways for you to connect your students to the web. Below is quick video that highlights what students can do with the web when given the opportunity.